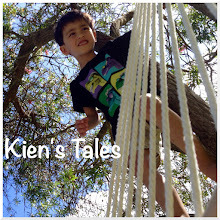 It took two days of rest and relaxation at home and Kien was back in full spring. Just as well, because when Kien is sick I hardly get any sleep, and it's truly exhausting parenting (or functioning as a normal human being) on lack of sleep! So I was glad to see that on Wednesday morning Kien was bubbly, smiling and really happy when he woke up. We are making the most of the summer weather. Last night we spent a bit of time playing outside. This is a new addition to our collection of flying objects in this household. Jef got it for Kien this week, and this thing sure can fly. No surprise that Kien loves playing with it. He chased it all around the garden, throwing it, scampering after it, flinging it by the wing, screaming in delight as it soars and then bunts into the ground. I'm wondering how long this glider will last?! It already has a few dents, and of course Kien wants to modify and stick thing to it. He said to me this morning, "Mummy, I want to put ailerons on the wings". He told a neighbour who stopped to admire the glider, "I'm going to glue another wing to this fuselage", as he points and demonstrates where it will go. Yeah, these are the types of conversations that go on in my house between my two construction captivated, radio control loving boys. I usually just nod and say, "Really? That's cool. You get your daddy to help you with that", because this vocabulary that my three year old has is like a foreign language I'm having to learn if I want to understand what he and Jef are doing at any given time.